Combining his legal experiences with his love of a good story, Don Eckhardt has created mystery/thrillers taken from current headlines. His novel, The Hannibal e-Puzzle, is an intelligent blend of history, computer technology, presidential politics, violence, and romance. 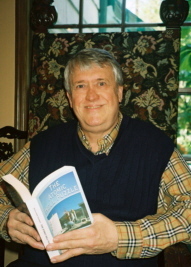 Eckhardt began his career as a novelist after a long and notable career in the law, using his knowledge and his imagination to craft suspenseful, entertaining, yet educational, mysteries that circumnavigate the globe. The Temper/Rowdy books, which include The Hannibal e-Puzzle as well as The Atomic Hell Puzzle, feature Temperance Link, daughter of U.S. Senator Will Link, and astronaut Rowdy Marshall. In Eckhardt’s latest mystery, our amateur sleuths receive mystifying e-mails from HANNIBAL warning of a conspiracy against the U.S. government. As they boldly trace the clues from Washington D.C. to New York’s historical Hudson Valley-to Revolutionary War heroes and villains-Temper and Rowdy discover the perils of electronic voting and uncover a terrorist plot that could devastate the Northeast. Eckhardt earned his doctorate in law from the University of Texas in 1966 and has practiced law for the past thirty-eight years, also serving as an attorney-mediator and arbitrator in a distinguished career. Now semi-retired, he is concentrating on his novels, which he researches meticulously, traveling to the locations he intends to use as backdrops for his stories. He has served on the Boards of the Association of Attorney-Mediators and Harris County Dispute Resolution Center; he was Vice-Chair of the Houston Bar Association's Alternative Dispute Resolution Section. Eckhardt is a Texas Bar Foundation fellow and a member of Mystery Writers of America.